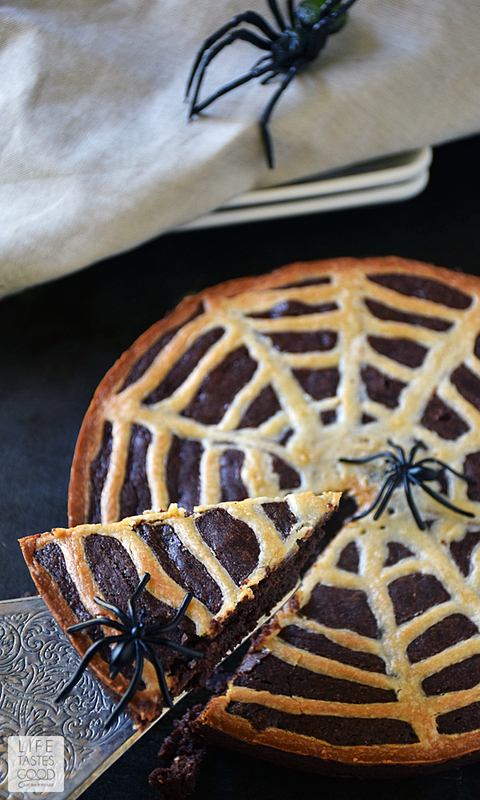 Spiderweb Brownies are a fun treat to celebrate Halloween. 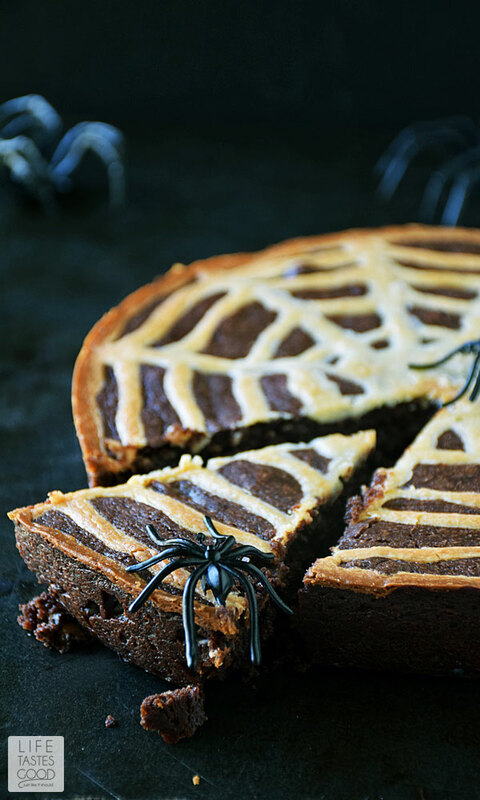 They are rich and chocolaty with a hint of tang from the cream cheese spiderweb on top, and these Spiderweb Brownies are just the right amount of spooky to bring out the smiles. 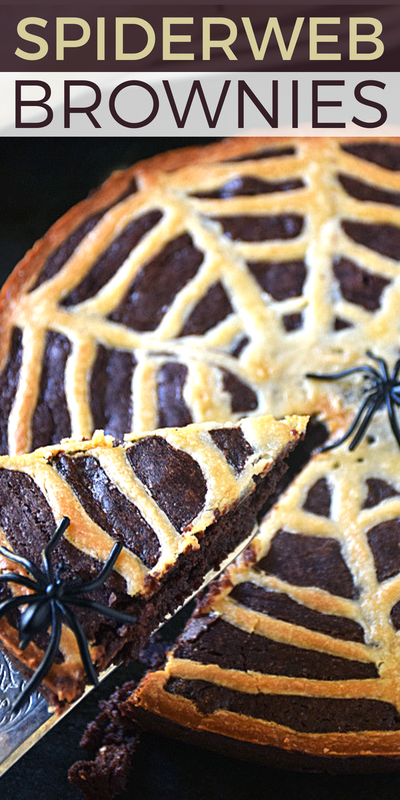 When Madison was little, I would make fun treats like these Spiderweb Brownies all the time. I loved to host Halloween parties for her friends. It was always so much fun coming up with new ideas that were spooky enough for the holiday, but not so much to induce nightmares. Spiders were always a good choice because they aren't too scary. 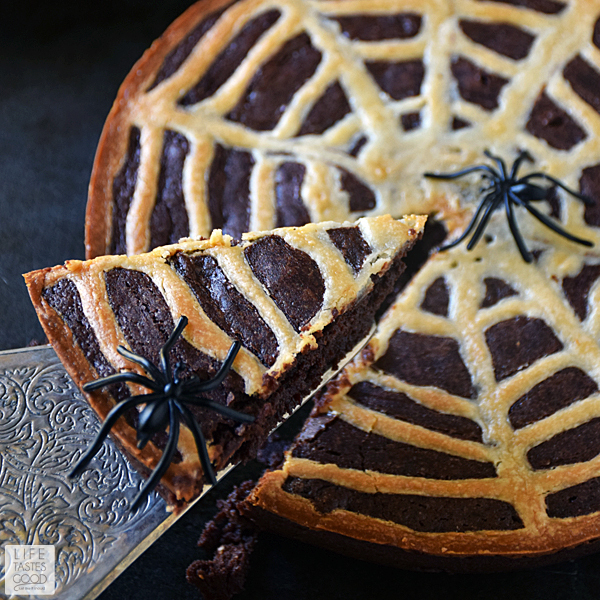 These Spiderweb Brownies are easy to make, chocolaty, and fun for kids of all ages! This Spiderweb Brownie recipe starts with my Easy One Bowl Brownies, as they have the taste and consistency I crave in a brownie. Rich and chocolaty, but not too sweet, and the crusty, crackly top contrasts nicely with the chewy, not too fudge-y middle. The perfect combo of texture and flavor! 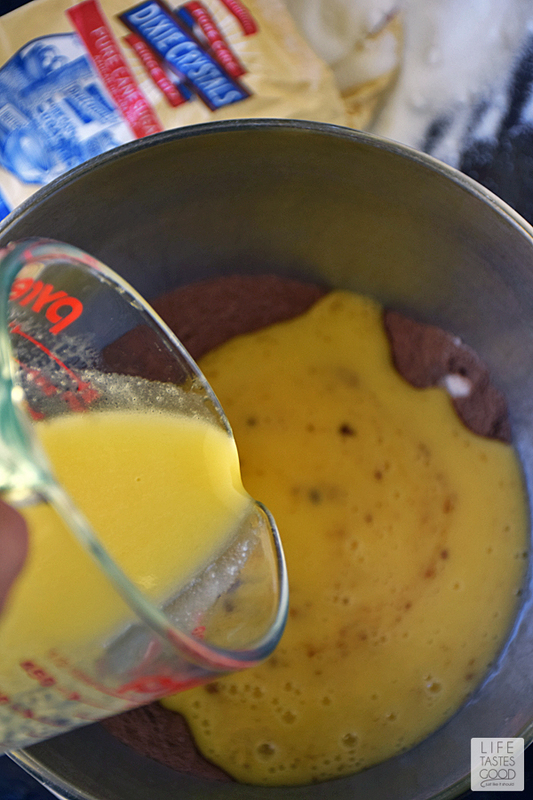 To make this easy one bowl brownie recipe, preheat the oven to 325°F. Grease an 8" round cake pan that is at least 2" deep and sprinkle with sugar to coat the bottom of the pan. In a large mixing bowl, combine 1 1/2 cups sugar, 3/4 cup all-purpose flour, 3/4 cup cocoa powder, and 1/2 teaspoon kosher salt. Whisk to mix well. Gently fold in 1/2 cup of semi-sweet chocolate chips and spread the batter into the prepared pan. Set aside. Prepare the cream cheese mixture by combining 3 ounces of softened cream cheese with 1/4 cup sugar and 2 tablespoons buttermilk (regular milk works fine too) in a mixing bowl. Using the whisk attachment, whip the cream cheese mixture until smooth and soft. Next, pipe thin lines from the middle of the brownie out to the edge, gently dragging the tip of the bag through the cream cheese circles as you go. Make these lines all the way around the brownie as shown in my picture below. Don't worry about making them perfect. It's a spiderweb and is supposed to be a little spooky. Clearly mine are a little rough, but the end result still turned out great! Bake at 325°F for 45-50 minutes or until a toothpick inserted near the center comes out with dry crumbs on it. 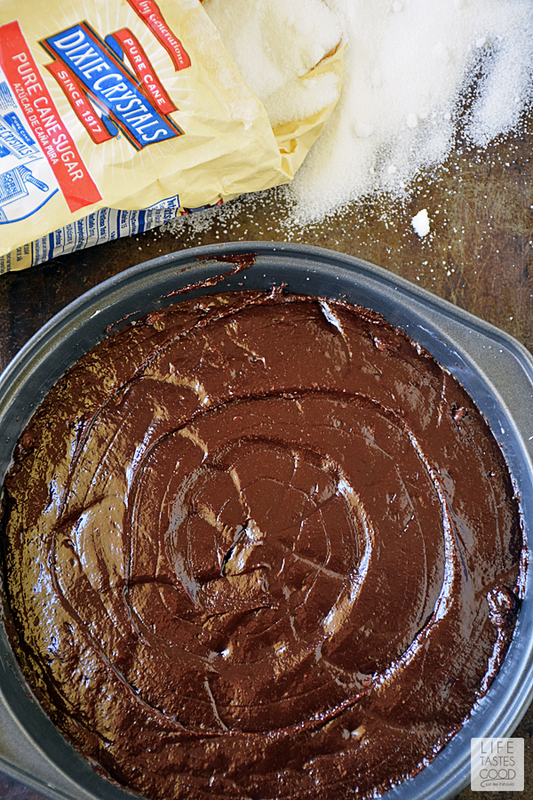 Remove the Spiderweb Brownies from the oven and let cool in pan for about 30 minutes. Before removing from the pan, run a butter knife around the outside edge of the brownie, gently lifting as you go to loosen from the bottom of the pan as well. Gently turn out onto a parchment lined surface and invert onto a cooling rack so the spiderweb is facing up. Allow to cool completely. 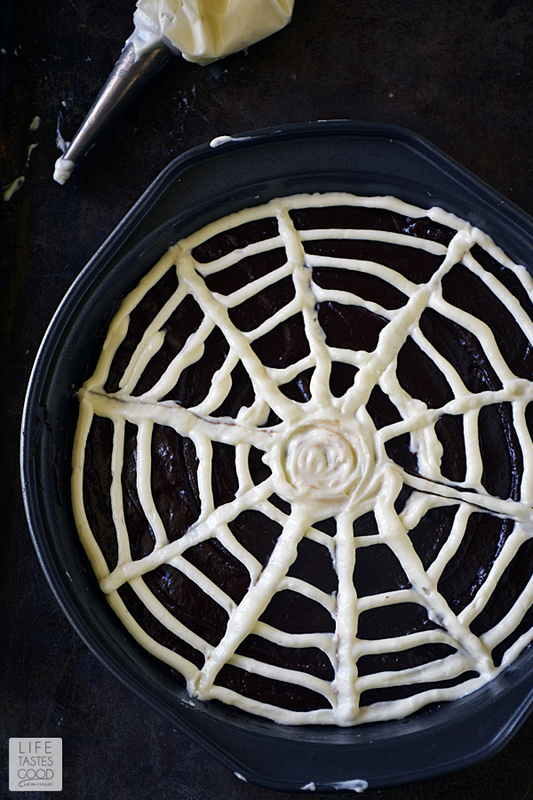 Transfer to a serving platter and decorate the spiderweb brownie with plastic spiders. Enjoy! Preheat the oven to 325°F. 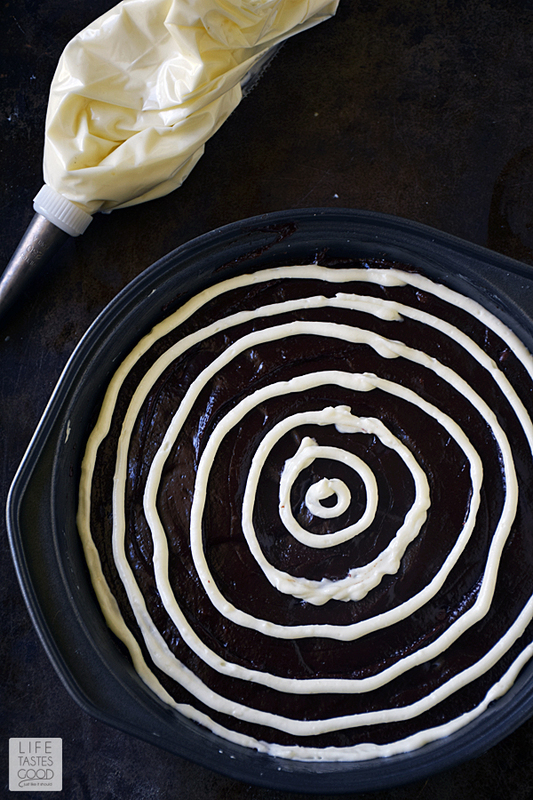 Grease an 8" round cake pan that is at least 2" deep and sprinkle with a little sugar to coat the bottom of the pan. 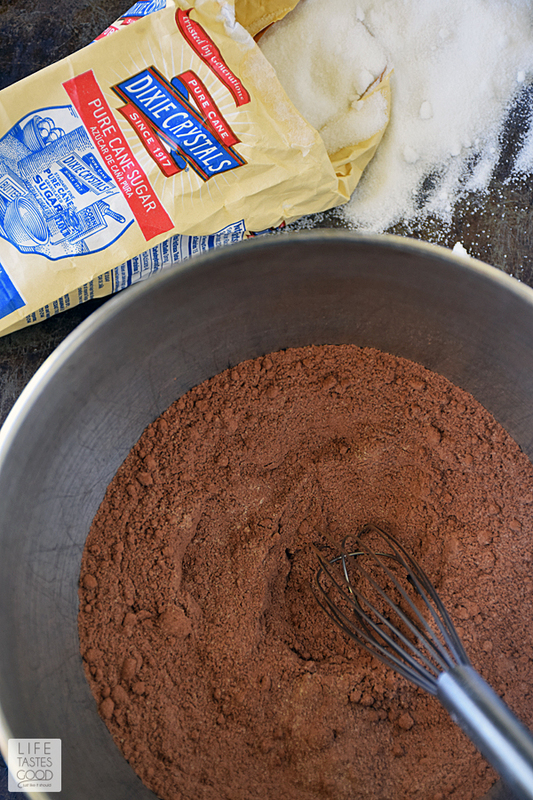 In a large mixing bowl, combine 1 1/2 cups Dixie Crystals Sugar, 3/4 cup all-purpose flour, 3/4 cup cocoa powder, and 3/4 teaspoon kosher salt. Whisk to mix well. Prepare the cream cheese mixture by combining 3 ounces of softened cream cheese with 1/4 cup Dixie Crystals Sugar and 2 tablespoons buttermilk (regular milk works fine too) in a mixing bowl. 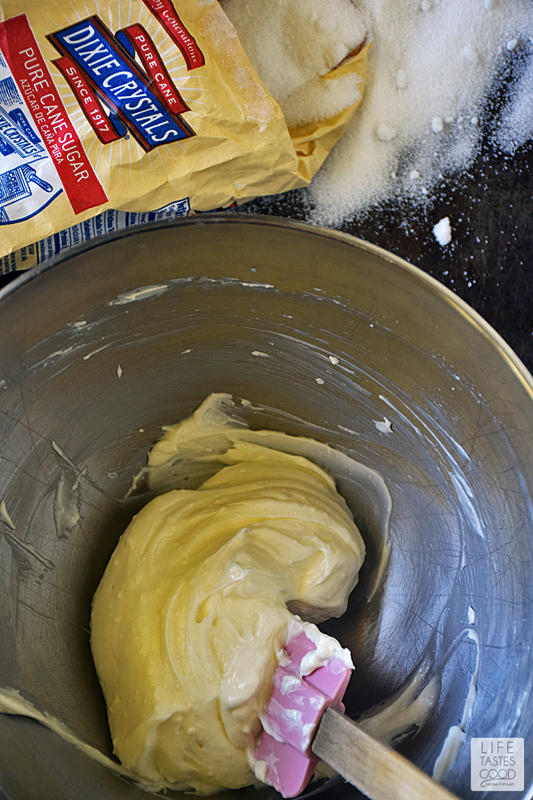 Using the whisk attachment, whip the cream cheese mixture until smooth and soft. Next, pipe thin lines from the middle of the pan out to the edge and across the circles, gently dragging the tip of the bag through the cream cheese circles as you go. Make these lines all the way around the pan as shown in my photo tutorial above. Don't worry about making them perfect. Clearly mine are a little rough, but the end result still turned out great! Bake at 325°F for 45-50 minutes or until a toothpick inserted near the center comes out with dry crumbs on it. Remove from the oven and let cool in pan for about 30 minutes. Before removing from the pan, run a butter knife around the edge, gently lifting as you go to loosen from the bottom of the pan as well. Gently turn out onto a parchment lined surface and invert onto a cooling rack so the spiderweb is facing up. Allow to cool completely. Transfer to a serving platter and decorate with plastic spiders. Enjoy! Awesome. I love how the web is baked into the brownie instead of decorated on top. These brownies are FAB! I love your creativity with the spiderweb design. These are the coolest brownies for Halloween ever! Ooooh you are too kind, Kami! Thank you so much! I will check out the conference and the affiliate program. I appreciate you sharing that info with me! Have a super week! These look fantastic!! I love the idea, I may have to recreate for Halloween!